Highside Farm is a traditional Lake District working sheep and beef farm. It has been farmed by the Mawson family for over 50 years. In 2003 the farmhouse was renovated over a period of months and put back together with love, focusing on attention to detail highlighting the authenticity of a working farm of the 1600’s. You will be assured of a first class and comfortable stay in our relaxed and luxurious Bed & Breakfast accommodation overlooking Bassenthwaite Lake. A luxurious and comfortable farm retreat with each of the rooms having been individually and carefully designed with you in mind. The farmhouse dates back to 1668 and still retains many of the original and traditional features such as oak beams and an inglenook fireplace. The array of antique furniture adds to the authentic look and combines an old feel with the comforts of modern day living. The farm is over 400 acres, nestled at the foot of Ullock Pike and spreads almost from the shores of Bassenthwaite Lake to the summit of the mighty Skiddaw. Breathtaking and idyllic views. Depending on the time of year you can experience the real farm life, witnessing the birth of a new lamb, almost from the comfort of your own bedroom window! Whether you are looking for that “stay on a farm experience” or just simply relaxed, luxury accommodation in spectacular surroundings, Highside Farm is the place to be. When it is finally time to put your head down for a relaxing night’s sleep, you have a choice of one of our Luxury Rooms or our Superior Rooms. Each room is named after the surrounding fells or its position. Most rooms look over the front of the farmhouse overlooking Bassenthwaite Lake or over the Courtyard at the back of the farm towards the mighty Skiddaw. Lake View is sumptuous, indulgent and relaxing. This superior room was converted from a Grade I listed barn and is self-contained, standing beside the main farm house. Lake View’s elevated position gives outstanding views across Bassenthwaite Lake, an excellent choice if you want some quiet romantic times away from the main farmyard to relax and recoup but still retaining the traditional and real feel of the farm life. Style and comfort with modern facilities, king size Athalone bedstead with sitting area to relax and reminisce about the day’s highlights and plan the adventures for the following day. There’a TV with surround sound, a DVD player and, if you have one, a dock for your iPod. There’s also a luxury, modern bathroom, containing electric shower and solid oak sink unit. Finest towelling white bathrobes are provided. We have one set tariff and this does not change by season or holiday period. All accommodation is based on per room per night. 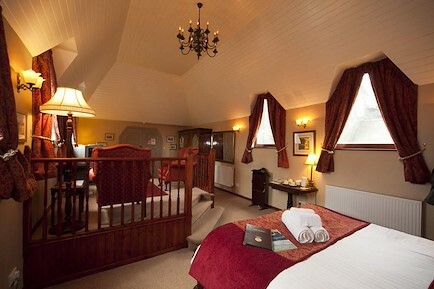 Ullock Pike is a spacious room with an impressive vaulted ceiling and original beams. Overlooking the front of the farm with views to Bassenthwaite Lake and surrounding fells. The décor is chic, simple and relaxing. Can sleep up to four people. Room Type: Family, double or twin occupancy. Wythop is a chic and cosy room with original beams and vaulted ceiling, boasting an original sandstone window opening, due to the window taxing of 1865 that now has to remain closed. The décor is chic, subdued and luxurious. Can sleep 2 people or individual occupancy. Room Type: Double or individual occupancy. Skiddaw is a practical and comfortable room featuring original beams. Overlooking the courtyard towards the back of the farm and the impressive, magnificent Skiddaw. The décor is chic, comfortable and inviting. Skiddaw is situated on the ground floor with good disabled access if required. Can sleep 2 people with double or twin configuration and individual occupancy. The Grainary was recently converted from an old barn and is one of two rooms, along with Raven Crag, contained in the same building separate from the main farm house. Each of these new rooms are perfect to stay in on their own but could easily be reserved as a pair for family and friends to be close together. The Grainary is located on the first floor and has views over the farmyard and towards the lake. The Grainary boasts a King size bed along with a sitting area to relax and share your memories of the day. It also features original stone facing and original beams. The room’s elevated position, with the view up the re-knowned Bassenthwaite lake, valley and eastern slopes of Ullock Pike, will surely inspire for the next days adventure. Flat screen TV, tea/coffee making facilities, wine glasses. Click the magnifying glass on the images below to see pictures of this room. Raven Crag was recently converted from an old barn and is one of two rooms, along with The Grainary, contained in the same building and separate from the main farm house. Each of these new rooms are perfect to stay in on their own but could easily be reserved as a pair for family and friends to be close together. Raven Crag is located on the ground floor and has great views over the sheep pen and up the valley. We hope you have booked to stay with us for more than one night: as you may see some of Martyns flock of sheep in this yard as he attends the shepherds work with animal husbandry. Turn off the M6 at Penrith (Junction 40).Travel on the A66 (Westbound) towards Keswick (by pass the first turning signposted Keswick). At the next roundabout take the 3rd exit signposted the A591 to Carlisle. Continue along the A591 for approximately 4 miles, Highside Farm is situated on your right hand side just before a small right-turn signposted Orthwaite. Leave Carlisle on the A591 heading towards Cockermouth. Continue for approximately 18 miles. Turn left on to the A591 at Bothel, signposted Keswick. Continue straight on that road for a further 7 miles. Highside Farm is situated on your left hand side, just after a small left-turn signposted Orthwaite and about 1 mile beyond the village of Bassenthwaite. Your enquiry will be sent directly to Highside Farm B&B. Please fill in as much detail as you can.